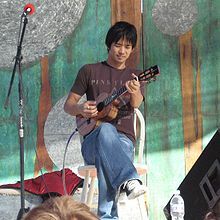 Moving on from an old school ukulele hero in the last edition, I now turn to a modern phenomenon, and what a player he is - Jake Shimabukuro. Jake is is a 34 year old virtuoso of ukulele - and virtuoso is exactly the right word when you see him play. Simple strums and catchy tunes are not for this player, rather sublimely complex renditions of pop, jazz and classical styles played in a mixture of strums and picks. Jake has brought the ukulele bang into the 21st century. Born in Honolulu, Hawaii, ( fifth generation Japanese American) he first picked up the uke at the age of four years old and never looked back. He came to public attention playing alongside Lopaka Colon and Jon Yamasato in the Hawaiian band, Pure Heart, with their first album winning four of the Hawaiian grammies including 'Most Promising Artists' and 'Album of the Year'. More recently Jake has performed solo and without a doubt has a huge career ahead. His style is contemporary, but capable of making even the hardest of music theorists raise an eyebrow, whether he is covering Bohemian Rhapsody, or something traditionally Hawaiian. In fact, he states his idols when growing up included Jimi Hendrix, Eddie Van Halen and Pat Metheny. His rise to fame was marked last year by accompanying Bette Midler in her spot at the British Royal Variety Performance, playing uke to the Beatles "In My Life" to rapturous applause. He has also played with Jimmy Buffett, Ziggy Marley and Cyndi Lauper. He is also famous on the youtube rounds, but Jake is no short term sensation and be prepared to see a LOT more of him. He claims (quite rightly in my opinion!) that the uke is the instrument of peace, and is famed for playing Kamaka instruments.